The United States is still a long way off from providing health care for all of its citizens. Even if you have health insurance, you might have a sky-high deductible or a very-low reimbursement rate. It is not unusual for even insured people to have tens of thousands of dollars in medical bills, and the uninsured and unemployed can have several times that amount. Unpaid medical debt will certainly be reported to the credit bureaus and should affect your score. According to a recent Consumer Report investigation, 30% of insured Americans have a medical bill sent to a collection agency. These bills could stretch already strapped consumers to the breaking point. Who was the doctor or hospital that billed you? What was the date you received medical treatment or were billed? As Consumer Reports found out, a large percentage of people with medical debt sent to collection agencies never knew about the bill, often because they had never received it. Another 1 in 10 people had already paid the bill when it was mistakenly sent to collections. Remember not to immediately agree to pay the collection agent. For one thing, the three credit bureaus (Experian, Equifax, and TransUnion) should not report the unpaid bill for 180 days. This gives you some time to find out more about the debt or negotiate a resolution before your score takes a hit. If you thought your insurer would cover the bill, you should the medical provider and your insurer. Explain the situation. The provider might agree to lower the amount and accept whatever your insurer agrees to pay. If you honestly think your insurer should cover the bill, then ask about how to appeal the insurance company’s denial. If your insurer ultimately pays the debt, the negative mark should be removed from your credit report. You should also check whether your doctor or hospital offers an installment plan, which will allow you to pay off the debt in monthly installments. Often, the interest rates on installment plans are lower than credit cards, so don’t pull out your Visa immediately to pay. If you need help negotiating with a hospital, you can contact the Patient Advocate Foundation. They can help you find ways to pay your debt. 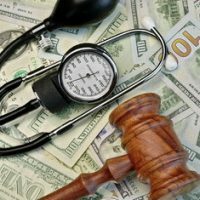 In some situations, a bankruptcy might be your best option for dealing with medical debt, but you should meet with an experienced attorney first. One errors consumers make is filing for bankruptcy too soon, before they receive all of their necessary medical treatment. Ideally, you do not want to file until you are well or have received all the treatment you will get. Contact Nowack & Olson today. One of our Plantation bankruptcy attorneys will review your circumstances and assess whether bankruptcy is the right move for you. Please call 866-907-2970 for a free consultation.